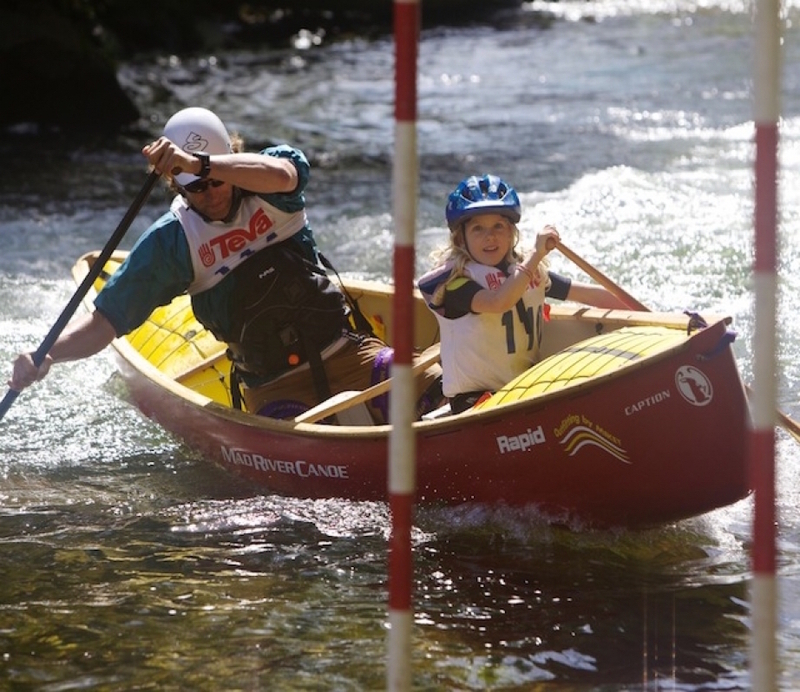 The Open Canoe Slalom Race is always the first weekend after Labour Day on the Gull River at the Minden Whitewater Preserve. Sept 6,7,8 2019 will be the 40th anniversary of the race. A celebration with catered dinner and party will mark the special event. The Gull River Open Canoe Slalom Race is held annually at the Minden Whitewater Preserve, near Minden, Ontario. The race draws canoeists from all over Ontario and often from other provinces as well as the U.S.
What is a Slalom Race? The slalom course consists of a series of 18 to 24 gates. Competitors are timed and must negotiate the gates in their numerical order, with time penalties added for touching or missing gates. Those considering competing should be solid intermediate or advanced paddlers with several years of experience in class III whitewater. Open canoes are dedicated whitewater canoes with outfitting and flotation. Registration takes place at the race site on Friday evening and Saturday morning and race bibs will be handed out then. There is no pre-registration. Volunteers are always needed and happily welcomed for judging gates and helping at race control or finish. No experience is necessary as volunteers are thoroughly briefed on the various jobs. The Gull River has easy access on the road side and offers great viewing, with some exciting river features and excellent paddlers. Come out and cheer on the racers! The Town of Minden is about 2.5 hrs. north east of Toronto on highway 35. The Preserve is located approximately 7 kilometers north east of Minden on the Gull River via Country Rd. 20. Turn South onto Bethel Road and cross the single lane stone bridge. The Minden Whitewater Preserve is privately owned and operated by Whitewater Ontario for the use of its members.